A new way of arranging advanced computer components called memristors on a chip could enable them to be used for general computing, which could cut energy consumption by a factor of 100. This would improve performance in low power environments such as smartphones or make for more efficient supercomputers, says a University of Michigan researcher. “Historically, the semiconductor industry has improved performance by making devices faster. But although the processors and memories are very fast, they can’t be efficient because they have to wait for data to come in and out,” said Wei Lu, U-M professor of electrical and computer engineering and co-founder of memristor startup Crossbar Inc.
Memristors might be the answer. Named as a portmanteau of memory and resistor, they can be programmed to have different resistance states–meaning they store information as resistance levels. These circuit elements enable memory and processing in the same device, cutting out the data transfer bottleneck experienced by conventional computers in which the memory is separate from the processor. … unlike ordinary bits, which are 1 or 0, memristors can have resistances that are on a continuum. Some applications, such as computing that mimics the brain (neuromorphic), take advantage of the analog nature of memristors. But for ordinary computing, trying to differentiate among small variations in the current passing through a memristor device is not precise enough for numerical calculations. Lu and his colleagues got around this problem by digitizing the current outputs—defining current ranges as specific bit values (i.e., 0 or 1). The team was also able to map large mathematical problems into smaller blocks within the array, improving the efficiency and flexibility of the system. Computers with these new blocks, which the researchers call “memory-processing units,” could be particularly useful for implementing machine learning and artificial intelligence algorithms. They are also well suited to tasks that are based on matrix operations, such as simulations used for weather prediction. The simplest mathematical matrices, akin to tables with rows and columns of numbers, can map directly onto the grid of memristors. The memristor array situated on a circuit board. Credit: Mohammed Zidan, Nanoelectronics group, University of Michigan. Once the memristors are set to represent the numbers, operations that multiply and sum the rows and columns can be taken care of simultaneously, with a set of voltage pulses along the rows. The current measured at the end of each column contains the answers. A typical processor, in contrast, would have to read the value from each cell of the matrix, perform multiplication, and then sum up each column in series. “We get the multiplication and addition in one step. It’s taken care of through physical laws. 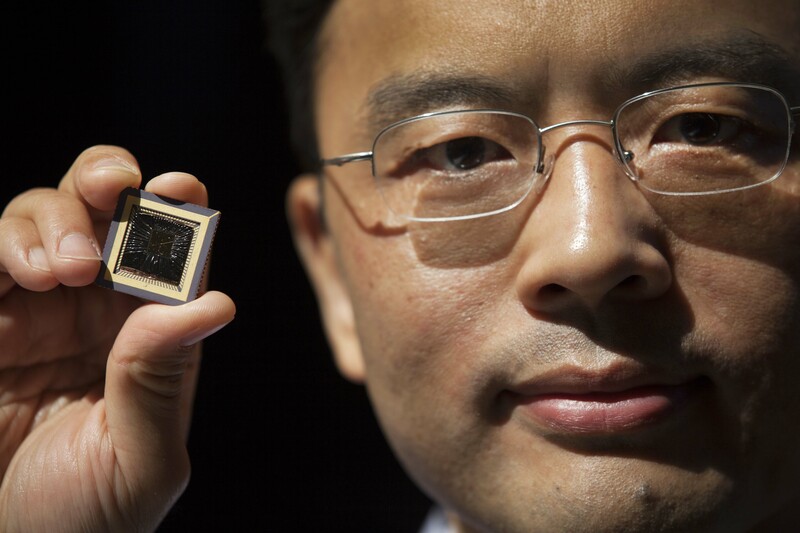 We don’t need to manually multiply and sum in a processor,” Lu said. His team chose to solve partial differential equations as a test for a 32×32 memristor array—which Lu imagines as just one block of a future system. These equations, including those behind weather forecasting, underpin many problems science and engineering but are very challenging to solve. The difficulty comes from the complicated forms and multiple variables needed to model physical phenomena. When solving partial differential equations exactly is impossible, solving them approximately can require supercomputers. These problems often involve very large matrices of data, so the memory-processor communication bottleneck is neatly solved with a memristor array. The equations Lu’s team used in their demonstration simulated a plasma reactor, such as those used for integrated circuit fabrication. This work is described in a study, “A general memristor-based partial differential equation solver,” published in the journal Nature Electronics. It was supported by the Defense Advanced Research Projects Agency (DARPA) (grant no. HR0011-17-2-0018) and by the National Science Foundation (NSF) (grant no. CCF-1617315). For the curious, Dr. Lu’s startup company, Crossbar can be found here. This entry was posted in energy, nanotechnology and tagged A general memristor-based partial differential equation solver, Bing Chen, brainlike computing, computing, DARPA, energy consumption, green computing, Jihang Lee, Mark J. Kushner, memristor startup Crossbar, memristors, Mohammed A. Zidan, Mohammed Zidan, neuromorphic computing, neuromorphic engineering, NSF, semiconductors, Shuo Huang, University of Michigan, US Defense Advanced Research Projects Agency, US National Science Foundation, Wei D. Lu, Wei Lu, YeonJoo Jeong on March 1, 2019 by Maryse de la Giroday. GLOBALFOUNDRIES [GF] today announced an important step in its transformation, continuing the trajectory launched with the appointment of Tom Caulfield as CEO earlier this year. In line with the strategic direction Caulfield has articulated, GF is reshaping its technology portfolio to intensify its focus on delivering truly differentiated offerings for clients in high-growth markets. GF is realigning its leading-edge FinFET roadmap to serve the next wave of clients that will adopt the technology in the coming years. The company will shift development resources to make its 14/12nm FinFET platform more relevant to these clients, delivering a range of innovative IP and features including RF, embedded memory, low power and more. To support this transition, GF is putting its 7nm FinFET program on hold indefinitely [emphasis mine] and restructuring its research and development teams to support its enhanced portfolio initiatives. This will require a workforce reduction, however a significant number of top technologists will be redeployed on 14/12nm FinFET derivatives and other differentiated offerings. I tried to find a definition for FinFet but the reference to a MOSFET and in-gate transistors was too much incomprehensible information packed into a tight space, see the FinFET Wikipedia entry for more, if you dare. In a major shift in strategy, GlobalFoundries is halting its development of next-generation chipmaking processes. It had planned to move to the so-called 7-nm node, then begin to use extreme-ultraviolet lithography (EUV) to make that process cheaper. From there, it planned to develop even more advanced lithography that would allow for 5- and 3-nanometer nodes. Despite having installed at least one EUV machine at its Fab 8 facility in Malta, N.Y., all those plans are now on indefinite hold, the company announced Monday. The move leaves only three companies reaching for the highest rungs of the Moore’s Law ladder: Intel, Samsung, and TSMC. GlobalFoundries rationale for the move is that there are not enough customers that need bleeding-edge 7-nm processes to make it profitable. “While the leading edge gets most of the headlines, fewer customers can afford the transition to 7 nm and finer geometries,” said Samuel Wang, research vice president at Gartner, in a GlobalFoundries press release. Fabless manufacturing is where the fabrication is outsourced and the manufacturing company of record is focused on other matters according to the Fabless manufacturing Wikipedia entry. EVER PREPPED A SPREAD for a party to then have less than half the people you were expecting show up? That’s probably how GlobalFoundries [sic] feels at the moment. The chip manufacturer, which was once part of AMD, had a fabrication process geared up for 7-nanometre chips which its customers – including AMD and Qualcomm – were expected to adopt. But AMD has confirmed that it’s decided to move its 7nm GPU production to TSMC, and Intel is still stuck trying to make chips based on 10nm fabrication. For most of our lives, the idea that computers and technology would get better, faster, and cheaper every year was as assured as the sun rising every morning. The story “GlobalFoundries Halts 7-nm Chip Development” doesn’t sound like the end of that era, but for you and anyone who uses an electronic device, it most certainly is. Technology innovation is going to take a different direction. At an event today [sept. 12, 2018], Apple executives said that the new iPhone Xs and Xs Max will contain the first smartphone processor to be made using 7 nm manufacturing technology, the most advanced process node. Huawei made the same claim, to less fanfare, late last month and it’s unclear who really deserves the accolades. If anybody does, it’s TSMC, which manufactures both chips. TSMC went into volume production with 7-nm tech in April, and rival Samsung is moving toward commercial 7-nm production later this year or in early 2019. GlobalFoundries recently abandoned its attempts to develop a 7 nm process, reasoning that the multibillion-dollar investment would never pay for itself. And Intel announced delays in its move to its next manufacturing technology, which it calls a 10-nm node but which may be equivalent to others’ 7-nm technology. There’s a certain ‘soap opera’ quality to this with all the twists and turns. This entry was posted in electronics, manufacturing, nanotechnology and tagged 10 nm node, 3nm chips, 5nm chips, 7nm (nanometer) computer chips, 7nm chips, AMD, Apple, chipmaking processes, computer chips, DARPA, extreme-ultraviolet lithography (EUV), Gartner, Global Foundries, GLOBALFOUNDRIES, Huawei, IBM, IEEE, Institute of Electronics and Electrical Engineers, Intel, iPhone Xs, iPhone Xs Max, Moore's Law, Qualcomm, Roland Moore-Colyer, Samsung, Samuel K. Moore, Samuel Wang, smartphone processor, Steve Blank, SUNY Polytechnic Institute's Colleges of Nanoscale Science and Engineering (SUNY Poly CNSE), Tom Caulfield, transistors, TSMC, U. Defense Advanced Research Agency on September 14, 2018 by Maryse de la Giroday. MIT engineers have developed new technology that could be used to evaluate new drugs and detect possible side effects before the drugs are tested in humans. Using a microfluidic platform that connects engineered tissues from up to 10 organs, the researchers can accurately replicate human organ interactions for weeks at a time, allowing them to measure the effects of drugs on different parts of the body. Such a system could reveal, for example, whether a drug that is intended to treat one organ will have adverse effects on another. These chips could also be used to evaluate antibody drugs and other immunotherapies, which are difficult to test thoroughly in animals because they are designed to interact with the human immune system. David Trumper, an MIT professor of mechanical engineering, and Murat Cirit, a research scientist in the Department of Biological Engineering, are also senior authors of the paper, which appears in the journal Scientific Reports. The paper’s lead authors are former MIT postdocs Collin Edington and Wen Li Kelly Chen. When developing a new drug, researchers identify drug targets based on what they know about the biology of the disease, and then create compounds that affect those targets. Preclinical testing in animals can offer information about a drug’s safety and effectiveness before human testing begins, but those tests may not reveal potential side effects, Griffith says. Furthermore, drugs that work in animals often fail in human trials. Complications can also arise due to variability among individual patients, including their genetic background, environmental influences, lifestyles, and other drugs they may be taking. “A lot of the time you don’t see problems with a drug, particularly something that might be widely prescribed, until it goes on the market,” Griffith says. As part of a project spearheaded by the Defense Advanced Research Projects Agency (DARPA), Griffith and her colleagues decided to pursue a technology that they call a “physiome on a chip,” which they believe could offer a way to model potential drug effects more accurately and rapidly. To achieve this, the researchers needed new equipment — a platform that would allow tissues to grow and interact with each other — as well as engineered tissue that would accurately mimic the functions of human organs. Before this project was launched, no one had succeeded in connecting more than a few different tissue types on a platform. Furthermore, most researchers working on this kind of chip were working with closed microfluidic systems, which allow fluid to flow in and out but do not offer an easy way to manipulate what is happening inside the chip. These systems also require external pumps. The MIT team decided to create an open system, which essentially removes the lid and makes it easier to manipulate the system and remove samples for analysis. Their system, adapted from technology they previously developed and commercialized through U.K.-based CN BioInnovations, also incorporates several on-board pumps that can control the flow of liquid between the “organs,” replicating the circulation of blood, immune cells, and proteins through the human body. The pumps also allow larger engineered tissues, for example tumors within an organ, to be evaluated. The researchers created several versions of their chip, linking up to 10 organ types: liver, lung, gut, endometrium, brain, heart, pancreas, kidney, skin, and skeletal muscle. Each “organ” consists of clusters of 1 million to 2 million cells. These tissues don’t replicate the entire organ, but they do perform many of its important functions. Significantly, most of the tissues come directly from patient samples rather than from cell lines that have been developed for lab use. These so-called “primary cells” are more difficult to work with but offer a more representative model of organ function, Griffith says. Using this system, the researchers showed that they could deliver a drug to the gastrointestinal tissue, mimicking oral ingestion of a drug, and then observe as the drug was transported to other tissues and metabolized. They could measure where the drugs went, the effects of the drugs on different tissues, and how the drugs were broken down. In a related publication, the researchers modeled how drugs can cause unexpected stress on the liver by making the gastrointestinal tract “leaky,” allowing bacteria to enter the bloodstream and produce inflammation in the liver. Kevin Healy, a professor of bioengineering and materials science and engineering at the University of California at Berkeley, says that this kind of system holds great potential for accurate prediction of complex adverse drug reactions. “While microphysiological systems (MPS) featuring single organs can be of great use for both pharmaceutical testing and basic organ-level studies, the huge potential of MPS technology is revealed by connecting multiple organ chips in an integrated system for in vitro pharmacology. This study beautifully illustrates that multi-MPS “physiome-on-a-chip” approaches, which combine the genetic background of human cells with physiologically relevant tissue-to-media volumes, allow accurate prediction of drug pharmacokinetics and drug absorption, distribution, metabolism, and excretion,” says Healy, who was not involved in the research. Griffith believes that the most immediate applications for this technology involve modeling two to four organs. Her lab is now developing a model system for Parkinson’s disease that includes brain, liver, and gastrointestinal tissue, which she plans to use to investigate the hypothesis that bacteria found in the gut can influence the development of Parkinson’s disease. Other applications include modeling tumors that metastasize to other parts of the body, she says. The research was funded by the U.S. Army Research Office and DARPA. In summary, we have demonstrated a generalizable approach to linking MPSs [microphysiological systems] within a fluidic platform to create a physiome-on-a-chip approach capable of generating complex molecular distribution profiles for advanced drug discovery applications. This adaptable, reusable system has unique and complementary advantages to existing microfluidic and PDMS-based approaches, especially for applications involving high logD substances (drugs and hormones), those requiring precise and flexible control over inter-MPS flow partitioning and drug distribution, and those requiring long-term (weeks) culture with reliable fluidic and sampling operation. We anticipate this platform can be applied to a wide range of problems in disease modeling and pre-clinical drug development, especially for tractable lower-order (2–4) interactions. This entry was posted in Uncategorized and tagged 10-organ body-on-a-chip, 9th World Congress on Alternatives to Animal Testing in the Life Sciences, alternatives to animal testing, animal testing, brain, Brij M. Bhushan, Catherine Communal, Christi D. Cook, Christian Maass, CN BioInnovations, Collin D. Edington, Collin Edington, Cynthia L. Stokes, DARPA, David J. Hughes, David L. Trumper, David Trumper, Douglas A. Lauffenburger, Duncan Freake, Emily Geishecker, Emily Suter, endometrium, gastrointestinal tissue, Gaurav Rohatgi, gut, heart, human-on-a-chip, in vitro pharmacology, Interconnected Microphysiological Systems for Quantitative Biology and Pharmacology Studies, Iris Lee, Jared Kirschner, Jason Velazquez, Jeremy J. Velazquez, Jiajie Yu, Jorge Valdez, Julia P. Papps, Kevin Healy, kidney, Laurie A. Boyer, Linda G. Griffith, Linda Griffith, Linda Stockdale, liver, Luis R. Soenksen, lung, Mario Gamboa, Massachusetts Instittute of Technology, Matthew E. LaBarge, Michael Shockley, microfluidic platform, microphysiological systems (MPS), MIT, multiple organ chips, Murat Cirit, Nicholas Vann, Nikolaos Tsamandouras, pancreas, physiome on a chip, primary cells, Rebecca L. Carrier, skeletal muscle, skin, Stephen Snyder, Steven R. Tannenbaum, Timothy Kassis, Tom Parent, UK, University of California at Berkeley, US, US Defense Advanced Research Projects Agency, Wen Li Kelly Chen, Xin Wang, Zhe Zhong on July 13, 2018 by Maryse de la Giroday. A University of Texas at Dallas graduate student, his advisor and industry collaborators believe they have addressed a long-standing problem troubling scientists and engineers for more than 35 years: How to prevent the tip of a scanning tunneling microscope from crashing into the surface of a material during imaging or lithography. Scanning tunneling microscopes (STMs) operate in an ultra-high vacuum, bringing a fine-tipped probe with a single atom at its apex very close to the surface of a sample. When voltage is applied to the surface, electrons can jump or tunnel across the gap between the tip and sample. The problem is, sometimes the tungsten tip crashes into the sample. If it physically touches the sample surface, it may inadvertently rearrange the atoms or create a “crater,” which could damage the sample. Such a “tip crash” often forces operators to replace the tip many times, forfeiting valuable time. Dr. John Randall is an adjunct professor at UT Dallas and president of Zyvex Labs, a Richardson, Texas-based nanotechnology company specializing in developing tools and products that fabricate structures atom by atom. Zyvex reached out to Dr. Reza Moheimani, a professor of mechanical engineering, to help address STMs’ tip crash problem. Moheimani’s endowed chair was a gift from Zyvex founder James Von Ehr MS’81, who was honored as a distinguished UTD alumnus in 2004. Randall said such precise manufacturing will lead to a host of innovations. In addition, Moheimani, a control engineer and expert in nanotechnology, said scientists are attempting to build transistors and quantum computers from a single atom using this technology. “There’s an international race to build machines, devices and 3-D equipment from the atom up,” said Moheimani, the James Von Ehr Distinguished Chair in Science and Technology. Randall said Zyvex Labs has spent a lot of time and money trying to understand what happens to the tips when they crash. Tajaddodianfar and Moheimani said the issue is the controller. It’s the feedback controller that fails to protect the tip from crashing into the surface, Tajaddodianfar said. “When the electronic properties are variable across the sample surface, the tip is more prone to crash under conventional control systems,” he said. “It’s meant to be really, really sharp. But when the tip crashes into the sample, it breaks, curls backward and flattens. According to Randall, Tajaddodianfar took logical steps for creating the solution. Moheimani said the group hopes to change their trajectory when it comes to building new devices. Randall said Tajaddodianfar’s algorithm has been integrated with its system’s software but is not yet available to customers. The research was made possible by funding from the Army Research Office and the Defense Advanced Research Projects Agency. This entry was posted in nanotechnology, Uncategorized and tagged DARPA, Farid Tajaddodianfar, imaging, James Owen, John N. Randall, John Randall, lithography, On the effect of local barrier height in scanning tunneling microscopy: Measurement methods and control implications, Reza Moheimani, S. O. Reza Moheimani, scanning tunneling microscopes (STMs), tip crash, tungsten tip, University of Texas at Dallas, US Army Research Office, US Defense Advanced Research Projects Agency, UT Dallas, Zyvex Labs on July 3, 2018 by Maryse de la Giroday. From various magnetic tapes, floppy disks and computer hard disk drives, magnetic materials have been storing our electronic information along with our valuable knowledge and memories for well over half of a century. In more recent years, the new types [sic] phenomena known as magnetoresistance, which is the tendency of a material to change its electrical resistance when an externally-applied magnetic field or its own magnetization is changed, has found its success in hard disk drive read heads, magnetic field sensors and the rising star in the memory technologies, the magnetoresistive random access memory. A new discovery, led by researchers at the University of Minnesota, demonstrates the existence of a new kind of magnetoresistance involving topological insulators that could result in improvements in future computing and computer storage. The details of their research are published in the most recent issue of the scientific journal Nature Communications (“Unidirectional spin-Hall and Rashba-Edelstein magnetoresistance in topological insulator-ferromagnet layer heterostructures”). “Our discovery is one missing piece of the puzzle to improve the future of low-power computing and memory for the semiconductor industry, including brain-like computing and chips for robots and 3D magnetic memory,” said University of Minnesota Robert F. Hartmann Professor of Electrical and Computer Engineering Jian-Ping Wang, director of the Center for Spintronic Materials, Interfaces, and Novel Structures (C-SPIN) based at the University of Minnesota and co-author of the study. While magnetic recording still dominates data storage applications, the magnetoresistive random access memory is gradually finding its place in the field of computing memory. From the outside, they are unlike the hard disk drives which have mechanically spinning disks and swinging heads—they are more like any other type of memory. They are chips (solid state) which you’d find being soldered on circuit boards in a computer or mobile device. Recently, a group of materials called topological insulators has been found to further improve the writing energy efficiency of magnetoresistive random access memory cells in electronics. However, the new device geometry demands a new magnetoresistance phenomenon to accomplish the read function of the memory cell in 3D system and network. Following the recent discovery of the unidirectional spin Hall magnetoresistance in a conventional metal bilayer material systems, researchers at the University of Minnesota collaborated with colleagues at Pennsylvania State University and demonstrated for the first time the existence of such magnetoresistance in the topological insulator-ferromagnet bilayers. The study confirms the existence of such unidirectional magnetoresistance and reveals that the adoption of topological insulators, compared to heavy metals, doubles the magnetoresistance performance at 150 Kelvin (-123.15 Celsius). From an application perspective, this work provides the missing piece of the puzzle to create a proposed 3D and cross-bar type computing and memory device involving topological insulators by adding the previously missing or very inconvenient read functionality. In addition to Wang, researchers involved in this study include Yang Lv, Delin Zhang and Mahdi Jamali from the University of Minnesota Department of Electrical and Computer Engineering and James Kally, Joon Sue Lee and Nitin Samarth from Pennsylvania State University Department of Physics. This research was funded by the Center for Spintronic Materials, Interfaces and Novel Architectures (C-SPIN) at the University of Minnesota, a Semiconductor Research Corporation program sponsored by the Microelectronics Advanced Research Corp. (MARCO) and the Defense Advanced Research Projects Agency (DARPA). This entry was posted in neuromorphic engineering and tagged computer hard disk drives, DARPA, Delin Zhang, electronic information, floppy disks, Interfaces and Novel Architectures (C-SPIN), James Kally, Jian-Ping Wang, Joon Sue Lee, magnetic materials, magnetic recording, magnetic tapes, magnetoresistance, magnetoresistive random access memory, Mahdi Jamali, memory, Microelectronics Advanced Research Corp. (MARCO), neuromorphic computing, Nitin Samarth, Pennsylvania State University, random access memory (RAM), Spintronic Materials, topological insulators, unidirectional spin Hall magnetoresistance, Unidirectional spin-Hall and Rashba−Edelstein magnetoresistance in topological insulator-ferromagnet layer heterostructures, University of Minnesota, US Defense Advanced Research Projects Agency, Yang Lv on March 30, 2018 by Maryse de la Giroday. Nearly 75 years ago, Nobel Prize-winning physicist Erwin Schrödinger wondered if the mysterious world of quantum mechanics played a role in biology. A recent finding by Northwestern University’s Prem Kumar adds further evidence that the answer might be yes. Kumar and his team have, for the first time, created quantum entanglement from a biological system. This finding could advance scientists’ fundamental understanding of biology and potentially open doors to exploit biological tools to enable new functions by harnessing quantum mechanics. Partially supported by the [US] Defense Advanced Research Projects Agency [DARPA], the research was published Dec. 5  in Nature Communications. In the study, Kumar’s team used green fluorescent proteins, which are responsible for bioluminescence and commonly used in biomedical research. The team attempted to entangle the photons generated from the fluorescing molecules within the algae’s barrel-shaped protein structure by exposing them to spontaneous four-wave mixing, a process in which multiple wavelengths interact with one another to produce new wavelengths. Through a series of these experiments, Kumar and his team successfully demonstrated a type of entanglement, called polarization entanglement, between photon pairs. The same feature used to make glasses for viewing 3D movies, polarization is the orientation of oscillations in light waves. A wave can oscillate vertically, horizontally, or at different angles. In Kumar’s entangled pairs, the photons’ polarizations are entangled, meaning that the oscillation directions of light waves are linked. Kumar also noticed that the barrel-shaped structure surrounding the fluorescing molecules protected the entanglement from being disrupted. Now that they have demonstrated that it’s possible to create quantum entanglement from biological particles, next Kumar and his team plan to make a biological substrate of entangled particles, which could be used to build a quantum machine. Then, they will seek to understand if a biological substrate works more efficiently than a synthetic one. This entry was posted in science and tagged biological system, bioluminescence, cognitive entanglement, DARPA, Erwin Schrödinger, Generation of photonic entanglement in green fluorescent proteins, green fluorescent proteins, Kim Fook Lee, Northwestern University, physics, polarization entanglement, Prem Kumar, quantum communications, quantum entanglement, quantum internet, quantum mechanics, Siyuan Shi, US Defense Advanced Research Projects Agency on February 12, 2018 by Maryse de la Giroday. China has some exciting news about the world’s first quantum network; it’s due to open in late August 2017 so you may want to have your congratulations in order for later this month. As malicious hackers find ever more sophisticated ways to launch attacks, China is about to launch the Jinan Project, the world’s first unhackable computer network, and a major milestone in the development of quantum technology. Named after the eastern Chinese city where the technology was developed, the network is planned to be fully operational by the end of August 2017. Jinan is the hub of the Beijing-Shanghai quantum network due to its strategic location between the two principal Chinese metropolises. “We plan to use the network for national defence, finance and other fields, and hope to spread it out as a pilot that if successful can be used across China and the whole world,” commented Zhou Fei, assistant director of the Jinan Institute of Quantum Technology, who was speaking to Britain’s Financial Times. By launching the network, China will become the first country worldwide to implement quantum technology for a real life, commercial end. It also highlights that China is a key global player in the rush to develop technologies based on quantum principles, with the EU and the United States also vying for world leadership in the field. The network, known as a Quantum Key Distribution (QKD) network, is more secure than widely used electronic communication equivalents. Unlike a conventional telephone or internet cable, which can be tapped without the sender or recipient being aware, a QKD network alerts both users to any tampering with the system as soon as it occurs. This is because tampering immediately alters the information being relayed, with the disturbance being instantly recognisable. Once fully implemented, it will make it almost impossible for other governments to listen in on Chinese communications. In the Jinan network, some 200 users from China’s military, government, finance and electricity sectors will be able to send messages safe in the knowledge that only they are reading them. It will be the world’s longest land-based quantum communications network, stretching over 2 000 km. However, Europe is also determined to also be at the forefront of the ‘quantum revolution’ which promises to be one of the major defining technological phenomena of the twenty-first century. The EU has invested EUR 550 million into quantum technologies and has provided policy support to researchers through the 2016 Quantum Manifesto. Quantum entanglement—physics at its strangest—has moved out of this world and into space. In a study that shows China’s growing mastery of both the quantum world and space science, a team of physicists reports that it sent eerily intertwined quantum particles from a satellite to ground stations separated by 1200 kilometers, smashing the previous world record. The result is a stepping stone to ultrasecure communication networks and, eventually, a space-based quantum internet. Entanglement involves putting objects in the peculiar limbo of quantum superposition, in which an object’s quantum properties occupy multiple states at once: like Schrödinger’s cat, dead and alive at the same time. Then those quantum states are shared among multiple objects. Physicists have entangled particles such as electrons and photons, as well as larger objects such as superconducting electric circuits. Starting in the 1970s, however, physicists began testing the effect over increasing distances. In 2015, the most sophisticated of these tests, which involved measuring entangled electrons 1.3 kilometers apart, showed once again that spooky action is real. Beyond the fundamental result, such experiments also point to the possibility of hack-proof communications. Long strings of entangled photons, shared between distant locations, can be “quantum keys” that secure communications. Anyone trying to eavesdrop on a quantum-encrypted message would disrupt the shared key, alerting everyone to a compromised channel. Popkin goes on to detail the process for making the discovery in easily accessible (for the most part) writing and in a video and a graphic. Quantum networking has already shown promise in terrestrial fiber networks, where specialized routing equipment can perform the same trick over conventional fiber-optic cable. The first such network was a DARPA-funded connection established in 2003 between Harvard, Boston University, and a private lab. In the years since, a number of companies have tried to build more ambitious connections. The Swiss company ID Quantique has mapped out a quantum network that would connect many of North America’s largest data centers; in China, a separate team is working on a 2,000-kilometer quantum link between Beijing and Shanghai, which would rely on fiber to span an even greater distance than the satellite link. Still, the nature of fiber places strict limits on how far a single photon can travel. China isn’t the only country working on bringing quantum networks to space. A collaboration between the UK’s University of Strathclyde and the National University of Singapore is hoping to produce the same entanglement in cheap, readymade satellites called Cubesats. A Canadian team is also developing a method of producing entangled photons on the ground before sending them into space. I wonder if there’s going to be an invitational event for scientists around the world to celebrate the launch. This entry was posted in science and tagged 2016 Quantum Manifesto, Albert Einstein, Boston University, Canada, China, DARPA, EU, European Union, Gabriel Popkin, Gregoire Ribordy, hack-proof communications, Harvard University, ID Quantique, Jinan Institute of Quantum Technology, Jinan Project, National University of Singapore, New York University (NYU), photons, physics, quantum communication network, quantum entanglement, Quantum Key Distribution (QKD) network, quantum key distribution networks, quantum keys, quantum networking, Quantum Revolution, quantum technology, quantum-encrypted message, Russell Brandom, Schrodinger's cat, Singapore, space science, Spanish National Research Council in Madrid, spooky action at a distance, Switzerland, Thomas Jennewein, Tim Byrnes, UK, unhackable computer network, University of Strathclyde, University of Waterloo, US, US Defense Advanced Research Projects Agency, Verónica Fernández Mármol, Zhou Fei on August 22, 2017 by Maryse de la Giroday. As embedded intelligence is finding its way into ever more areas of our lives, fields ranging from autonomous driving to personalized medicine are generating huge amounts of data. But just as the flood of data is reaching massive proportions, the ability of computer chips to process it into useful information is stalling. Now, researchers at Stanford University and MIT have built a new chip to overcome this hurdle. The results are published today in the journal Nature (“Three-dimensional integration of nanotechnologies for computing and data storage on a single chip”), by lead author Max Shulaker, an assistant professor of electrical engineering and computer science at MIT. Shulaker began the work as a PhD student alongside H.-S. Philip Wong and his advisor Subhasish Mitra, professors of electrical engineering and computer science at Stanford. The team also included professors Roger Howe and Krishna Saraswat, also from Stanford. Computers today comprise different chips cobbled together. There is a chip for computing and a separate chip for data storage, and the connections between the two are limited. As applications analyze increasingly massive volumes of data, the limited rate at which data can be moved between different chips is creating a critical communication “bottleneck.” And with limited real estate on the chip, there is not enough room to place them side-by-side, even as they have been miniaturized (a phenomenon known as Moore’s Law). To make matters worse, the underlying devices, transistors made from silicon, are no longer improving at the historic rate that they have for decades. The new prototype chip is a radical change from today’s chips. It uses multiple nanotechnologies, together with a new computer architecture, to reverse both of these trends. Instead of relying on silicon-based devices, the chip uses carbon nanotubes, which are sheets of 2-D graphene formed into nanocylinders, and resistive random-access memory (RRAM) cells, a type of nonvolatile memory that operates by changing the resistance of a solid dielectric material. The researchers integrated over 1 million RRAM cells and 2 million carbon nanotube field-effect transistors, making the most complex nanoelectronic system ever made with emerging nanotechnologies. The RRAM and carbon nanotubes are built vertically over one another, making a new, dense 3-D computer architecture with interleaving layers of logic and memory. By inserting ultradense wires between these layers, this 3-D architecture promises to address the communication bottleneck. The key in this work is that carbon nanotube circuits and RRAM memory can be fabricated at much lower temperatures, below 200 C. “This means they can be built up in layers without harming the circuits beneath,” Shulaker says. This provides several simultaneous benefits for future computing systems. “The devices are better: Logic made from carbon nanotubes can be an order of magnitude more energy-efficient compared to today’s logic made from silicon, and similarly, RRAM can be denser, faster, and more energy-efficient compared to DRAM,” Wong says, referring to a conventional memory known as dynamic random-access memory. “In addition to improved devices, 3-D integration can address another key consideration in systems: the interconnects within and between chips,” Saraswat adds. To demonstrate the potential of the technology, the researchers took advantage of the ability of carbon nanotubes to also act as sensors. On the top layer of the chip they placed over 1 million carbon nanotube-based sensors, which they used to detect and classify ambient gases. Due to the layering of sensing, data storage, and computing, the chip was able to measure each of the sensors in parallel, and then write directly into its memory, generating huge bandwidth, Shulaker says. Three-dimensional integration is the most promising approach to continue the technology scaling path set forth by Moore’s laws, allowing an increasing number of devices to be integrated per unit volume, according to Jan Rabaey, a professor of electrical engineering and computer science at the University of California at Berkeley, who was not involved in the research. “One big advantage of our demonstration is that it is compatible with today’s silicon infrastructure, both in terms of fabrication and design,” says Howe. The team is working to improve the underlying nanotechnologies, while exploring the new 3-D computer architecture. For Shulaker, the next step is working with Massachusetts-based semiconductor company Analog Devices to develop new versions of the system that take advantage of its ability to carry out sensing and data processing on the same chip. So, for example, the devices could be used to detect signs of disease by sensing particular compounds in a patient’s breath, says Shulaker. This work was funded by the Defense Advanced Research Projects Agency [DARPA], the National Science Foundation, Semiconductor Research Corporation, STARnet SONIC, and member companies of the Stanford SystemX Alliance. This entry was posted in electronics, nanotechnology and tagged 3D architecture, 3D computer chips, Analog Devices, carbon nanotube field-effect transistors, carbon nanotubes, CMOS (complementary metal-oxide-semiconductor), computer chips, computing, DARPA, data storage, Gage Hills, H.-S. Philip Wong, Jan Rabaey, Ken Hansen, Krishna Saraswat, Massachusetts Institute of Technology, Max M. Shulaker, Max Shulaker, MIT, Moore's Law, nanomaterials, NSF, Rebecca S. Park, resistive random access memory (RRAM), Roger Howe, Roger T. Howe, Sam Fuller, Semiconductor Research Corporation, silicon, Stanford SystemX Alliance, Stanford University, STARnet SONIC, Subhasish Mitra, Three-dimensional integration of nanotechnologies for computing and data storage on a single chip, transistors, UC Berkeley, University of California at Berkeley, US Defense Advanced Research Projects Agency, US National Science Foundation on August 22, 2017 by Maryse de la Giroday. This is the second IBM computer announcement I’ve stumbled onto within the last 4 weeks or so, which seems like a veritable deluge given the last time I wrote about IBM’s computing efforts was in an Oct. 8, 2015 posting about carbon nanotubes,. I believe that up until now that was my most recent posting about IBM and computers. IBM (NYSE: IBM) and the U.S. Air Force Research Laboratory (AFRL) today [June 23, 2017] announced they are collaborating on a first-of-a-kind brain-inspired supercomputing system powered by a 64-chip array of the IBM TrueNorth Neurosynaptic System. The scalable platform IBM is building for AFRL will feature an end-to-end software ecosystem designed to enable deep neural-network learning and information discovery. The system’s advanced pattern recognition and sensory processing power will be the equivalent of 64 million neurons and 16 billion synapses, while the processor component will consume the energy equivalent of a dim light bulb – a mere 10 watts to power. 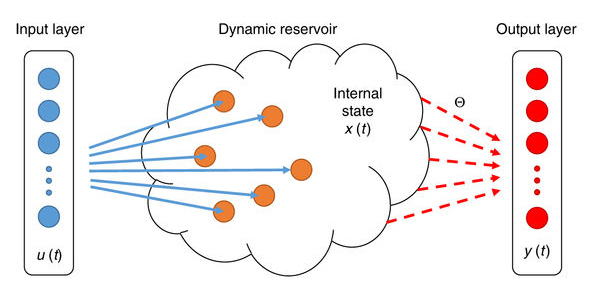 IBM researchers believe the brain-inspired, neural network design of TrueNorth will be far more efficient for pattern recognition and integrated sensory processing than systems powered by conventional chips. AFRL is investigating applications of the system in embedded, mobile, autonomous settings where, today, size, weight and power (SWaP) are key limiting factors. The IBM TrueNorth Neurosynaptic System can efficiently convert data (such as images, video, audio and text) from multiple, distributed sensors into symbols in real time. AFRL will combine this “right-brain” perception capability of the system with the “left-brain” symbol processing capabilities of conventional computer systems. The large scale of the system will enable both “data parallelism” where multiple data sources can be run in parallel against the same neural network and “model parallelism” where independent neural networks form an ensemble that can be run in parallel on the same data. The system fits in a 4U-high (7”) space in a standard server rack and eight such systems will enable the unprecedented scale of 512 million neurons per rack. A single processor in the system consists of 5.4 billion transistors organized into 4,096 neural cores creating an array of 1 million digital neurons that communicate with one another via 256 million electrical synapses. For CIFAR-100 dataset, TrueNorth achieves near state-of-the-art accuracy, while running at >1,500 frames/s and using 200 mW (effectively >7,000 frames/s per Watt) – orders of magnitude lower speed and energy than a conventional computer running inference on the same neural network. The IBM TrueNorth Neurosynaptic System was originally developed under the auspices of Defense Advanced Research Projects Agency’s (DARPA) Systems of Neuromorphic Adaptive Plastic Scalable Electronics (SyNAPSE) program in collaboration with Cornell University. In 2016, the TrueNorth Team received the inaugural Misha Mahowald Prize for Neuromorphic Engineering and TrueNorth was accepted into the Computer History Museum. Research with TrueNorth is currently being performed by more than 40 universities, government labs, and industrial partners on five continents. 2016 was a big year for brain-inspired computing. My team and I proved in our paper “Convolutional networks for fast, energy-efficient neuromorphic computing” that the value of this breakthrough is that it can perform neural network inference at unprecedented ultra-low energy consumption. Simply stated, our TrueNorth chip’s non-von Neumann architecture mimics the brain’s neural architecture — giving it unprecedented efficiency and scalability over today’s computers. The brain-inspired TrueNorth processor [is] a 70mW reconfigurable silicon chip with 1 million neurons, 256 million synapses, and 4096 parallel and distributed neural cores. For systems, we present a scale-out system loosely coupling 16 single-chip boards and a scale-up system tightly integrating 16 chips in a 4´4 configuration by exploiting TrueNorth’s native tiling. For the scale-up systems we summarize our approach to physical placement of neural network, to reduce intra- and inter-chip network traffic. The ecosystem is in use at over 30 universities and government / corporate labs. Our platform is a substrate for a spectrum of applications from mobile and embedded computing to cloud and supercomputers. TrueNorth, once loaded with a neural network model, can be used in real-time as a sensory streaming inference engine, performing rapid and accurate classifications while using minimal energy. TrueNorth’s 1 million neurons consume only 70 mW, which is like having a neurosynaptic supercomputer the size of a postage stamp that can run on a smartphone battery for a week. U.S. Army Research Lab (ARL) prototyped a computational offloading scheme to illustrate how TrueNorth’s low power profile enables computation at the point of data collection. Using the single-chip NS1e board and an Android tablet, ARL researchers created a demonstration system that allows visitors to their lab to hand write arithmetic expressions on the tablet, with handwriting streamed to the NS1e for character recognition, and recognized characters sent back to the tablet for arithmetic calculation. Of course, the point here is not to make a handwriting calculator, it is to show how TrueNorth’s low power and real time pattern recognition might be deployed at the point of data collection to reduce latency, complexity and transmission bandwidth, as well as back-end data storage requirements in distributed systems. U.S. Air Force Research Lab (AFRL) contributed another prototype application utilizing a TrueNorth scale-out system to perform a data-parallel text extraction and recognition task. In this application, an image of a document is segmented into individual characters that are streamed to AFRL’s NS1e16 TrueNorth system for parallel character recognition. Classification results are then sent to an inference-based natural language model to reconstruct words and sentences. This system can process 16,000 characters per second! AFRL plans to implement the word and sentence inference algorithms on TrueNorth, as well. Lawrence Livermore National Lab (LLNL) has a 16-chip NS16e scale-up system to explore the potential of post-von Neumann computation through larger neural models and more complex algorithms, enabled by the native tiling characteristics of the TrueNorth chip. For the Supercomputing paper, they contributed a single-chip application performing in-situ process monitoring in an additive manufacturing process. LLNL trained a TrueNorth network to recognize seven classes related to track weld quality in welds produced by a selective laser melting machine. Real-time weld quality determination allows for closed-loop process improvement and immediate rejection of defective parts. This is one of several applications LLNL is developing to showcase TrueNorth as a scalable platform for low-power, real-time inference. I gather this 2017 announcement is the latest milestone on the TrueNorth journey. This entry was posted in electronics, nanotechnology, robots and tagged 16 billion synapses, 64 million neurons, artificial neural networks, Ben Shaw, brain-inspired supercomputing system, Brian Taba, Computer History Museum, Convolutional networks for fast, Cornell University, Daniel S. Goddard, DARPA, deep learning, deep neural-network learning, Dharmendra Modha, Dharmendra S. Modha, energy-efficient neuromorphic computing, human brain’s neural architecture, IBM, IBM TrueNorth Neurosynaptic System, Jun Sawada, Lawrence Livermore National Laboratory (LLNL), LLNL, Misha Mahowald Prize for Neuromorphic Engineering, neural network model, neuromorphic computing, neuromorphic engineering, non-von Neumann architecture, Pallab Datta, Systems of Neuromorphic Adaptive Plastic Scalable Electronics (SyNAPSE) program, TrueNorth, TrueNorth chip, TrueNorth Ecosystem for Brain-Inspired Computing: Scalable Systems Software and Applications, TrueNorth processor, U.S. Air Force Research Laboratory, U.S. Air Force Research Laboratory (AFRL), U.S. Army Research Laboratory, US Defense Advanced Research Projects Agency on July 11, 2017 by Maryse de la Giroday.